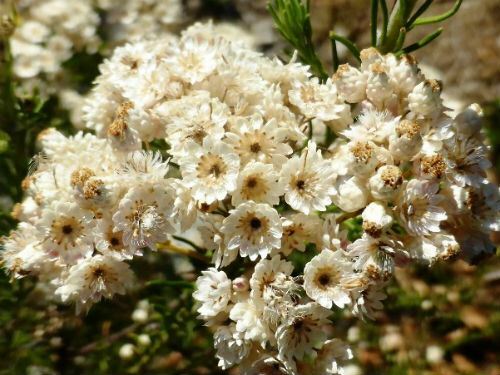 Ozothamnus diosmifolius was previously known as Helichrysum diosmifolius and is known variously as Sago Flower and Rice Flower. Both names probably refer to the shape of the buds. The Rice Flower is a shrub that will reach a height of two metres. Flowers appear in winter and spring. They are carried, at the ends of branches, in dense globular clusters. Buds may be pink and they open to small white to pink flowers. What the flowers lack in size they make up for in quantity. O. diosmifolius tends to become rather straggly so pruning is necessary after flowers fade. The species is widely grown for the cut flower trade and a number of cultivars have been developed. One cultivar is 'Royal Flush' that has purplish buds opening to pink flowers. 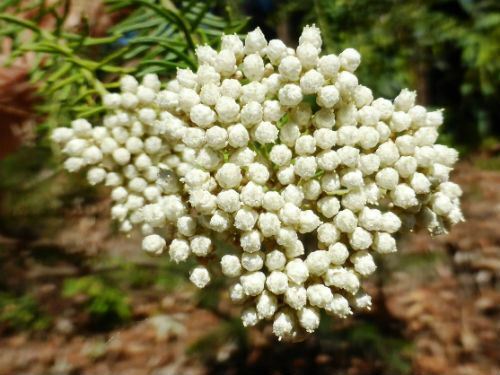 O. diosmifolius is a widespread species and is found throughout eastern NSW as well as Queensland. The species is cultivated in California.